Blizzard is going to elaborate lengths in revealing new cards for Hearthstone’s Boomsday Project expansion, and today’s card reveal is no exception. Here we have part one of the Lab Logs, taking the form of an extensive short story leading us to the reveal of the Menacing Nimbus. Menacing Nimbus is a two-mana 2/2 shaman minion, classified as an elemental. The stormy little guy has a battlecry which allows you to add a random elemental to your hand. 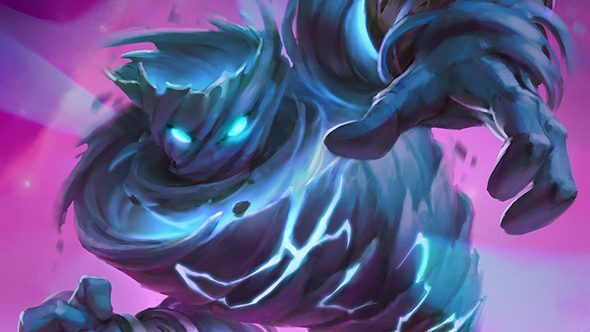 There’s a whole expansion’s worth of card reveals left to determine the meta, but it looks like elemental shamans might soon become a more viable option. Deal yourself in to the best card games on PC. I’m not going to try summarizing the whole short story here – you’re better off reading it for yourself at the official site if you’re in the mood for a little Hearthstone-flavoured mad science. “Part one” implies we’ll see more of these Lab Logs, and though short fiction isn’t quite as cool as the cartoon that introduced us to Stargazer Luna, it’s still a fun way to see some new cards revealed. Blizzard also released a new Hearthside Chat today, detailing what to expect from the new Magnetic keyword. We still have a while to wait for the full Boomsday Project reveal livestream, which is scheduled for July 23. We can expect a steady drip of new card reveals until then.